(Photo: Asbury Park Press photo/Doug Hood ) TOMS RIVER – Margaret Quinn responded to 32 online ads, spoke with 14 real estate agents, went to 10 open houses, called four apartment complexes, asked FEMA for a trailer and sought advice from Gov. Chris Christie on how she could find a short-term rental for her family when it came time for her rebuilt house to be elevated. People like the Quinns have jumped in and out of the rental housing market since Superstorm Sandy, revealing the meager supply of apartments and rental homes on the Jersey Shore and constricting it even further. First, countless residents displaced by Sandy who sought apartments ended up couch-surfing with friends or family, hoping their story would draw some empathy from a landlord or real estate agent with an opening. “When Sandy hit and we needed extra rental housing to accommodate those that were displaced, it just wasn’t there,” said Jim Hughes, the dean of the Edward J. Bloustein School of Planning and Public Policy at Rutgers University and an expert on New Jersey housing. Now, with 3,300 families moving off the Reconstruction, Rehabilitation, Elevation and Mitigation program waiting list in June and a total of 3,150 RREM awards pledged, a new wave of homeowners is searching for somewhere to stay while their houses are being elevated. The latest vacancy rates released by the New Jersey Apartment Association show 4 percent of rental units in Ocean County and 2.5 percent in Monmouth County — the counties hit hardest by Sandy — were empty this past winter. That’s quite an improvement for Ocean County, where less than 1 percent of rentals were available during winter 2012-13, a period that started about two months after Sandy made landfall in New Jersey. Doug Quinn, no relation to Margaret, and his 17-year-old daughter Megan were put up by a rotating list of friends after Sandy caused the Kettle Creek to rise up and into their Toms River home. “I would pick up my daughter from school and then we’d have dinner at the diner and we would talk about whose house we wanted to stay at that night,” he recalled. “We spent exactly 20 minutes there,” Quinn said. 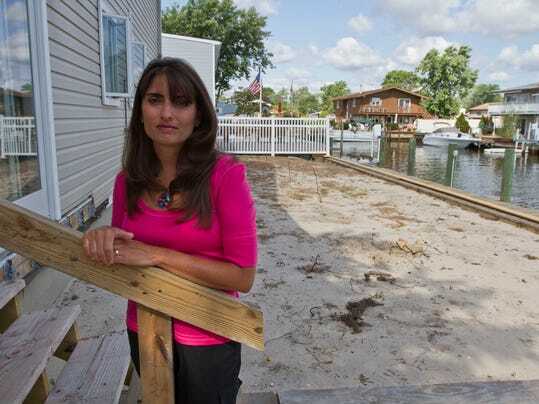 He eventually found a rental in Toms River, but he’s been there much longer than he had anticipated as he continues to challenge what he believes is a woefully low settlement offer from his flood insurance provider. It’s never been easy to find a four-bedroom apartment for about $1,800 a month, said Jerry Lamberson, a Hazlet man who is living with his wife and six kids at a hotel for the time being. But ever since Sandy, his options for affordable housing have dwindled as displaced homeowners scrambled to find what they thought would be temporary fix, but ended up staying much longer. “If you do find something, now they want an arm and a leg for it, instead of just an arm,” joked Lamberson, who works at the hotel. The U.S. Department of Housing and Urban Development’s Fair Market Rent measurement, which HUD uses in its housing voucher calculations, will rise 2 percent to $1,373 in Monmouth and Ocean counties in October, according to a proposed annual readjustment released on Aug. 15. Median rent — half the rents were higher, half were lower — for a two-bedroom in Monmouth and Ocean counties actually dropped in this federal fiscal year, which ends Sept. 30. According to HUD, the typical two-bedroom in the two counties cost $1,444, compared to $1,515 in 2013 and $1,495 in 2012. The Housing and Community Development Network of New Jersey posted a recent report showing 44 percent of the state’s low-income renters spent more than half of their income on rent and utilities. For displaced homeowners, a $1,500 apartment might end up being more than the mortgage they are still paying for a home they can’t live in. The Ocean County Long Term Recovery Group, which coordinates disaster recovery efforts for qualifying individuals and families, said since July 1 there has been a “dramatic” rise in the calls to their office looking for rental assistance. A likely contributor to that spike is housing assistance programs are drying up, Executive Director Sue Marticek said,. People spent much more time in a rental than they had anticipated because of the glacial pace of programs like RREM, she said. To address the issue of supply, tens of millions of dollars in disaster aid financing are available for the creation of affordable rental housing, but that money is only meant to replenish the apartment units lost because of Sandy. “Unfortunately, even after all of those homes will be built, the long-term shortage will still remain,” said Adam Gordon, an attorney for the Fair Share Housing Center, an affordable-housing advocate for low-income New Jerseyans. To settle a complaint with housing and minority advocates, the state agreed on May 29 to spend an additional $215 million of its federal disaster aid allocation on multifamily housing construction. Per the agreement, the state must spend 52 percent of all disaster money dedicated to building duplexes and apartments in Monmouth and Ocean counties. The state has committed about $40.6 million to seven projects in Ocean and Monmouth counties so far. Another seven are in the pipeline, according to Lisa Ryan, spokeswoman for the state Department of Community Affairs. All together, those projects will create more than 1,000 affordable rental units in the two counties, and people displaced by Sandy have first crack at leasing those apartments. Apartment housing wasn’t being developed at the same pace after Sandy, according to building permit data gathered by the Census Bureau. In Monmouth and Ocean counties, a total of 106 multifamily buildings have been permitted, accounting for 593 new units, from after Sandy and through June, the data shows. By comparison, in the 20 months before Sandy, building permits were obtained for 945 new rental units in the two counties. So far, an estimated $606 million has been spent or committed to construct more than 3,000 new single-family homes after Sandy, or 14 times more than has been appropriated for multifamily buildings. Many Jersey Shore towns historically have been more welcoming to office and retail development and less so to apartment buildings, Gordon said. “The main reason is the fear that their municipal budget or school budget will be detrimentally affected,” Ladell said.